"Good" art is very subjective. "Printable" and "functional" art are not. They are defined by the parameters and limitations of screen printing. Sometimes simple changes in artwork can take a print job from impossible and cost prohibitive to attainable and inexpensive. Non-creative art charges of $45 per hour will be charged for repairing, editing and recreating any art supplied with deficiencies or changes required (1/2 hour minimum). Creative art charges of $45 per hour (1/2 Hour minimum) will be charged for taking your design from concept to film. No art charges will be incurred if output ready digital artwork is provided. Conventional art such as paintings, photographs, transparencies, drawings, laser prints, inkjet prints, Xerox copies, faxes, business cards and letterhead will require scanning and layout in preparation for output to film or vellum. Art charges will be incurred to make them output ready. Separation charges will apply for Process and Simulated Process jobs. Please call or come by for a quote. You can supply your artwork in digital format by email if it is less than 9 MB. It is a good idea to Stuff or ZIP all artwork being electronically transferred. It will insure that the resource fork will be preserved and the files will arrive intact. Email art to: info@fwscreen.com. We keep the latest and greatest versions of all the BEST graphics software. We accept digital artwork in the following programs and their respective formats. Adobe Illustrator - .ai, .eps, .pdf. ALL FONTS MUST BE TURNED TO OUTLINES and all placed images should be embedded or supplied with at least 150 dpi resolution at 100% of the output size. File should be sent over with 300 dpi or greater resolution. If your file has layers please do not flatten. Always make a flat .jpg to send along with the layered files. Macromedia Freehand - .psd, .eps, .tif. Submit all digital files at 100% with lasers showing the composition as well as any color breaks. When sending e-mail include all files necessary. ALWAYS CONVERT ALL FONTS TO OUTLINES. Use only Pantone Color Matching System (PMS) when selecting inks. Make sure to specify COATED numbers. When pulling art from the internet or scans, always convert to vector art. Digital art requiring any computer manipulation, clean-up or masking will incur art charges. Artwork and typesetting created in PowerPoint, Word Perfect and similar software programs cannot be easily converted into acceptable artwork. Please call or come by for a quote to recreate your design. Our prices are based upon the number of ink colors in design (art) that is printed in each location. Each color used in a design cost more to screen print. A one color design is cheaper than a 2 color design. The number of locations on a garment increases the cost. A two location print costs more than a 1 location print. The size of the design does not affect the price. A small left chest print cost the same to print as a large full size print. However, oversize does change the price. Quantity is the key. The total number of shirts dictates the prices you are charged. 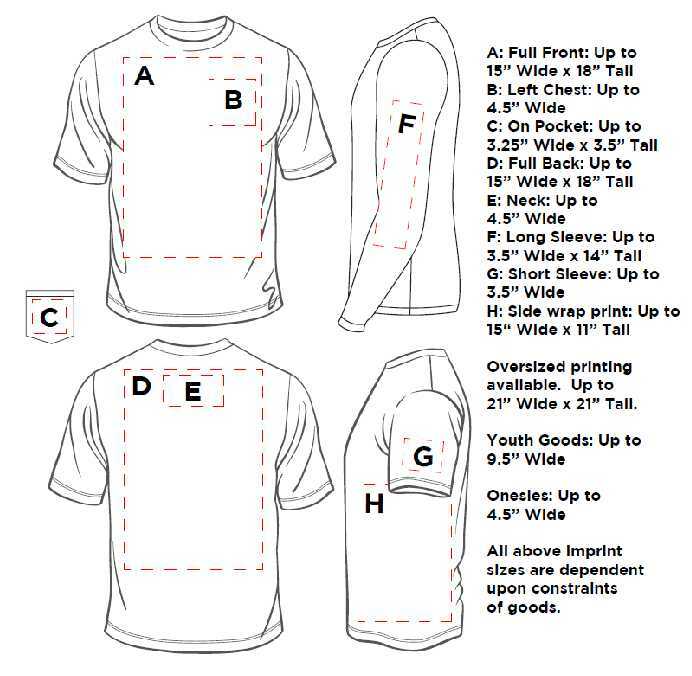 The more shirts we print, the lower your prices will be, up to a certain point. Photographic Art (or Photo Realistic Design) is Art that incorporates scanned in imagery, or art that is built in a pixel based program such as photoshop or photo paint. Common file extensions for such files are .psd, .tif, .jpg, & .gif. This includes any art built in a vector-based program, such as illustrator, that also incorporates imported or placed photographic elements. In order to reproduce a photographic image, we require a file or scan with a resolution of 300 pixels per inch file at actual size, or the actual photo. Vector Art is art that is built (actually drawn) in a vector or object based program such as Adobe Illustrator, Corel Draw or Macromedia Freehand. Each object can be selected and individually manipulated independently from the rest of the image. Common files extensions for this type of file include .ai, .eps & .cdr. When providing such files, it is important to CREATE OUTLINES OUT OF ALL TEXT USED. If we have a true vector art file (ie. Adobe Illustrator file with no placed images) resolution is not a concern. Charges for pre-production samples will be based upon the set-up required. Please call for a quote. Any job requiring changes or variations from the original instructions will be billed for setup charges. 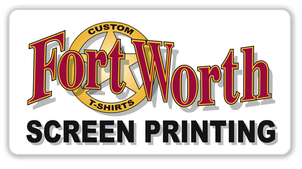 To get more information on pricing policies please call us at 817.336.7777 or email info@fwscreen.com.